Anxiety-based disorders are among the most common mental health problems experienced in the population today. Worry is a prominent feature of most anxiety-based disorders including generalized anxiety disorder, specific phobias, obsessive-compulsive disorder, panic disorder, and post-traumatic stress disorder. 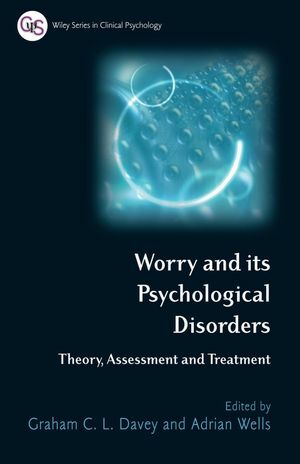 Written by international experts, Worry and its Psychological Disorders offers an up-to-date and complete overview of worry in a single volume. Divided into four sections, the book explores the nature of worry, the assessment of worry, contemporary theories of chronic and pathological worry, and the most recently developed treatment methods. It includes in-depth reviews of new assessment instruments and covers treatment methods such as Cognitive Behavioural Therapy and Metacognitive Therapy. Useful case studies are also included. This important volume provides an invaluable resource for clinical practitioners and researchers. It will also be of relevance to those studying clinical or abnormal psychology at advanced level. Graham Davey is Professor of Psychology at the University of Sussex in Brighton, UK. He has been an active researcher in areas associated with anxiety and its disorders, especially pathological worrying, phobias, and perseverative psychopathologies generally. He has published his research in many high-impact international journals including Journal of Abnormal Psychology, Behavioral & Brain Sciences, Journal of Experimental Psychology, and Behaviour Research & Therapy. He has authored or edited a total of 11 books, including Davey, G.C.L. (1997) (Ed) Phobias: A handbook of theory, research and treatment, Chichester:Wiley,andDavey, G.C.L.&Tallis, F. (1994) (Eds) Worrying: Perspectives on theory, assessment and treatment, Chichester: Wiley. He was elected President of the British Psychological Society from 2002–2003. Adrian Wells is Professor of Clinical & Experimental Psychopathology at the University of Manchester, and Professor II in Clinical Psychology at the Norwegian University of Science and Technology, Trondheim. He is Honorary Consultant Clinical Psychologist in Manchester Mental Health Trust. He has published over 100 scientific papers and book chapters in the area of cognitive theory and therapy of emotional disorders. His books include Wells, A. (1997) Cognitive Therapy of Anxiety Disorders: A Practice Manual and Conceptual Guide, Chichester, UK: Wiley, and Wells, A. (2000) Emotional Disorders and Metacognition: Innovative Cognitive Therapy, Chichester, UK: Wiley. He is the originator of metacognitive therapy and has also contributed to the development of cognitive therapy for anxiety disorders. He is a founding fellow of the Academy of Cognitive Therapy, USA.